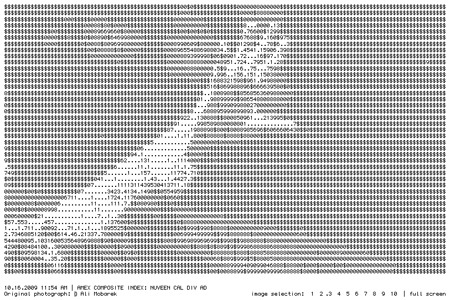 All Over is an online work intended for the Internet. 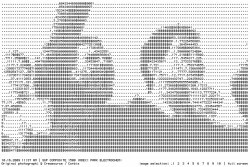 A series of images made only of black typographical characters against a white background, in the style of “ASCII Art”, are shown one by one on the screen. Those images evolve before the eyes of the spectator, as the characters that make them – digits, numbers, monetary signs – are replaced by others. These visible elements are data gathered in real time, acting on the work in a dynamic way. These data come in real time from worldwide changes in the market. in the same way that the commercial activity of a company or of a country depends on the state of its finances. 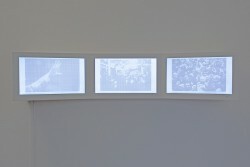 The photographs are disturbed, symbolically disturbing what they represent as well. The display of thee images without a legend and without sound is ambivalent. They put figures on display who raise their arms, seem to scream, alone or in groups, who can evoke both traders selling on the stock market floor, or protesters chanting slogans in the street. The work invokes them one by one, without letting us identify them, thus putting the actors of the system and those who suffer it on the same plane, in a metaphor according to which they are all its victims given their dependence on its fluctuations. With All Over, Samuel Bianchini puts physical and symbolic operations into action, in public and in real time. 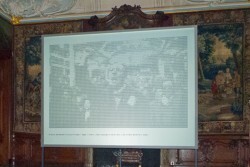 The spectator is encouraged to contemplate the work, to reflect as well as to act. All Over, an online instrument, is a project produced by the Jeu de Paume (Paris) for its “Virtual Space” exhibit, made in partnership with Corbis France. Samuel Bianchini (1971-) is a French artist and teacher-researcher. He directs the research group on interactive and performative devices, Reflective Interaction, at the Ecole Nationale Supérieur des Arts Décoratifs laboratory (Paris). His works, while maintaining the principle of an “operational aesthetic,” question the repercussions of technological devices, in particular on our modes of representation, our new types of aesthetic experiences and sociopolitical organizations.